Eleanor Grayson is examined with a telehealth machine in her home at The Village at Summerville. Listen to the story... My Telehealth is a production of South Carolina ETV. a member of the South Carolina Telehealth Alliance. The Village at Summerville started using telehealth equipment to address this concern, connecting the nursing staff with doctors at the Medical University of South Carolina to consult with patients in their rooms, and possibly prevent unnecessary hospital visits. Dr. Blackwelder says it’s a great asset for his facility, but experts say it’s rare among nursing homes across the country. Broadband access, substantial electronic medical records systems, and proper training are necessary for telehealth to work in nursing homes. According to Steve Chies, the chair of the Health Information Technology Committee for the American Health Care Association, many rural parts of the United States don’t have that already in place. 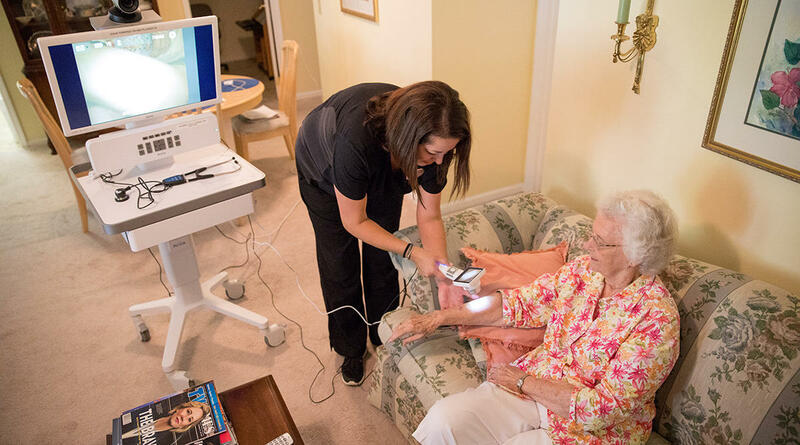 Photo Caption: Eleanor Grayson is examined with a telehealth machine in her home at The Village at Summerville.